I love finding ways to turn everyday common items, which would otherwise go into the garbage, into beautiful items that everyone can enjoy! 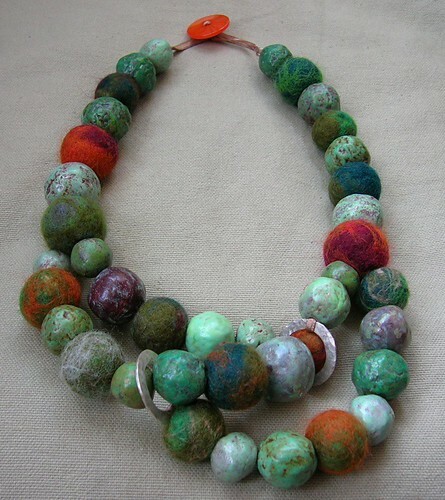 So… when I came across a gal who was making beautiful beads from recycled newspaper, I had to share the idea with you! When I saw Helen’s beautiful beads, I asked her if she would mind sharing how she made them. After hearing from her, I realized that the methods used for these beads, were the exact same methods that I have used for several different projects including; costumes, handcrafted paper, and sculpted home decor items. I think what I love about her beads though… is the natural earthy look that they have. Please click on the pictures & visit Helen at her Flickr space! Step #1 – Gather a small pile of newspapers from the recycling basket. Here’s a mix of paper & felt beads. I love the look of this mix! And… don’t stop at just making beads! Well, I think you will agree when I say that these little bits of recycled newspaper are some of the most beautiful bits I’ve ever seen! I was wondering if you could use old magazines? I think this would be a great art project when my neice has her group of girlfriends over for a sleepover weekend. Fun way to make ‘chunky’ jewelry. might be a great Mothers Day project for my 9-10 year old boys Homeschool group of friends too. Thanks for the reminder that this a fun way to recycle. I have the same plans for my daughter! She LOVES beads, and I thought this would be a great way for her to make up some great styles of her own – as well as for her friends! And… a string of “chunky” beads used to be cheap in the stores – NOT SO anymore! The colors are so natural looking…I think I will try small size egg shapes to go in a nest my son gave me. Won’t those look cute painted like Robin eggs? Lisa – That’s a wonderful idea! You could make all sorts of beautiful eggs this way! I like the ethnic look of these. A great project to share some quality time with my 11 year old daughter. I love this idea! It looks easy and inexpensive enough. Hopefully I can give this a try sometime soon. Thank you so much for sharing. Very good idea.I will try. Could you make the beads larger like the size of a baseball? I think it would look beautiful on my coffee table. IS there any trick to making the colors look so natural? I’m sure you could make anything out of this product! I’ve used it for several different items. These would be great tucked inside a birds nest, in a wooden butter bowl, or something similar. You could always make them hollow by putting paper mache around balloons as I’m not sure how well a big ball of wet glue and paper will dry, but I’ve done this before with balloons and it’s worked great. yeah right> dis will be gonna my nicest project in our school!!! I was also wondering how she made the paint look so cool. I love these. And the felt beads, what’s that all about? Too cool? Does she make those too? Please share the painting method. Oh I love this…how beautiful. And to think they are made from old newspaper. The mix of the beads with the felt is gorgeous. Thank you for sharing this clever use of recycled newspaper! Great project – thanks for the instructions. I think I will try making different sized spheres (3, 4, 5 inches in diameter), decorating, and then display in a wooden or glass bowl. Kelly – Sounds like you & your daughters are very close! I love to hear about these kinds of “family” times together! Please do share your creations with all of us! I love the beads made by Helen from recycled newspapers. The instructions said to paint them with acrylic paints. But, how do you achieve the multi-colored, natural, marbleized look? Thanks so much for your feedback. Where can you buy these necklaces? They’re lovely! I so want to go and make some right now, and guess what! I’ve got everything I need at home! I love doing crafty things and that looks so easy and fun. I so want to be making some recycled beads! I shall be passing on the page to a friend who’s doing a jewellery making course at the moment. I’m sure she’ll be thrilled at being able to make endless beads for next to nothing. Thanks for your kind words! I hope your friend enjoys the how-to! can I suggest that you use a scewer or an even finer metal wire for making the holes while they dry. You might wait a while before you put them on the wire or scewer so the beads firm up, but poke a hole first,(with a toothpick? )one on each end so the holes look neat and tidy, and then put them on the steek. I’m not sure the medium would hold up so be careful and try it first. I love the felt idea. How about dryer lint? the quality of your presentation and apparent care make this site a treasure. the idea of using parenting or bonding with friends around recycling is what this society needs. paperweights–chimes–mobiles–faux-ceramic dishes–bead curtains–wall bead chains–belts–shoe bobbles–enough? Very clever–you’re right about all the possibilities there are with these! This is so cool! I have done a similar project, but I use rose petals instead (when you wear them, the scent rubs off!). And instead of drilling a hole into the beads, I puncture them with a needle or a small taper before they dry. I wrote an article about rose petal beads several years ago… yes they are WONDERFUL… and so romantic! could you tell me about what you did with the rose petals. and I love the beads making, my granddaughter that is 6 loves beading, and we got right on it, she didnt want to leave to go home until she could see them. but we will work on the together tomorrow. thanks. hi, this is such a great way to use old paper, really want to try it for myself but am just wondering what ind of drill do you use to make the holes and do I need a vice on a work bench to hold the bead while I drill it??? You don’t have to actually use a drill if you’d rather not. You can simply poke a hole through the bead with a toothpick while you’re forming the shape. Remember to twist the toothpick a bit as the dry, so they don’t stick to the beads. The drill just makes the whole process much easier & the holes all the same size, etc. I love these beads and the project. A friend once used the same technique for breaking the papers down in boiling water etc. But then put the boiled and drained paper scraps into a food processor. After shredding, mixed with paste and then put the mixture over an overturned bowl. Leaving it out to dry for several days…you end up with the mixture pulling away from the bowl/mold and you have a bowl. You paint it, decorate it with pictures or cutouts…or just a painted design. And then varnish. You can’t eat out of it or put liquid in it…but use it decoratively. This is a great tutorial. I love these beads, I just might have to find a way to incorporate them into a set of cards! p.s. The toile background on your site is very nice, I just designed/printed a letterpress stationery set for a client which included a wood box faced in toile wrapping paper. This is an awesome way to recycle! I tried it and made some beads, but I can’t quite get the colors to marble like you did. Any tips? You could paint the beads any way you’d like. 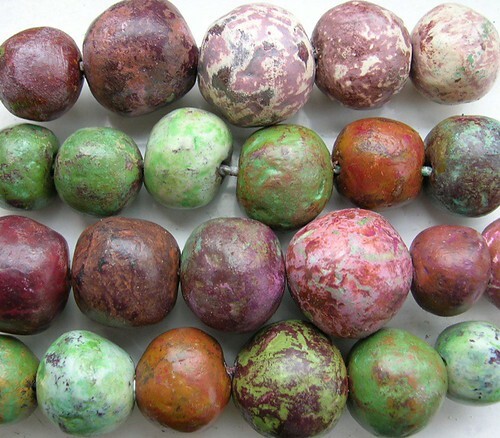 To get the marble look… you would paint the beads one color… then use a different color after the first color is dry. Make sure to allow some of the first color to peek through the top coat. the beads are gorgeous – i can’t wait to try this! thank you for sharing! These look great! Thanks for this article. How did you paint them to get that crackle look? I love that. I love the natural ethnic look of these beads. I can see my daugther and I have great fun making these next weekend. Are the felt beads made with the same technique? Sono collane bellissime, colori molto gradevoli e di buon gusto. Thank you very much for the translation. That was quite interesting. I’m Helen (the maker of the beads in the photographs!) Thank you for all your lovely comments. To get the mottled effect I paint lots of layers of different coloured paint on the beads and then sandpaper them down again to reveal the layers underneath. Hope you’re all having fun making them! I’m fascinated with this project. What type of paint did you use on the beads once they dried? How do you make the colors of the beads look like that? can i make it out of colored paper instead? i dont have paint but i do have lots of colored paper. any ideas or suggestions are welcomed! The Beauty of this method is… you could use just about any paper that you have around the house! I bet you could! And get lovely colors, too. How long do the necklaces typically last? Would moisture, sweating be an issue? i second above comment! i would love to know how well they hold up through time and wear. and what kind of ‘varnish’ would you recomend? Great idea, I’ll have to try this. What type of varnish do you use? Just wanted to say these beads are gorgeous and thanks for sharing them. I have two questions, though. Firstly, when I tried this project myself i had some difficulties because the newspaper would make little clumps, making the beads somewhat fragile. Do you have any suggestions as to how to avoid this? Secondly, I myself would like to know what varnish you use! I am amazed at these beads. Brilliant idea!! Oh, my gosh! I am so excited to find this and to try it! What fun!! This is a great project, looks wonderful! Can someone please tell me how to get the beads to form. We made a few beads but are having trouble with the paper staying together. We have added a ton of glue and still nothing. Pingback: Ð¢Ð°Ñ‚ÑŒÑÐ½Ð° Ð”ÑƒÐ±Ð¸Ð½ÑÐºÐ°Ñ » ÐœÐ¾Ð´Ð½Ñ‹Ðµ ÑƒÐºÑ€Ð°ÑˆÐµÐ½Ð¸Ñ Ð¸Ð· ÑÑ‚Ð°Ñ€Ñ‹Ñ… Ð³Ð°Ð·ÐµÑ‚. I’ve just been using regular varnish (the kind you’d buy in a hardware store and use on wood!). I use a few coats. With regards to the paper holding together to form the beads, I have had a couple that fall apart too, expecially when I come to drill the hole. It seems to happen to me when the paper hasn’t broken down into tiny enough pieces and sort of clumps together. I try to get a really smooth papier mache mixture with the paper completely broken down so it’s almost like a paste. (I’ve been putting the mixture in a blender to do this!). I’ve also found that if I try to squeeze too much of the water out when I’m rolling them up then they’ll fall apart too. Not sure exactly how durable they are yet! I started making them about a year ago and the first one’s I made are still looking good. The main drawback is that they’re not waterproof but apart from that they seem to be pretty durable. I haven’t tried the beads yet but I use this same process to make bowls. I make large paper bowls. I found not only does old newspaper work well but also egg cartons. I can’t recycle them so I put them to use this way. I too use the process of blending. Be careful how much paper and water you put in the blender so that you don’t burn out the blenders motor. The paper is heavy so I only fill the blender to half full. If you blend paper this way you can also make bowls without the glue if you want to. As for durability I have painted the bowls and they will hold water. I still won’t recommend putting food in them that way. I would think that the paint and varnish should make the beads sturdier as in the bowls. This is a wonderful tutorial and all the other comments are great. Thanks. u guys are so creative! any ideas to decorate notice board? Your beads looks like precious stones, very unique. I love this process and have started making lots of beads. Mine are still a bit rough but I like the look. So far have just used some for a bracelet which I threaded on elastic cord. I put a glass bead between each paper bead. Tips I found good, roll balls when some water in mixture, hold together better. Don’t use too much glue. To paint them, thread onto a chopstick, tell where I live? I even partly dried some in the microwave and they were fine. There aren’t words for how much I love this. I guess it helps that I abhor junk mail and enough of mine is on newsprint that I will definintely be upcycling it like this! Thank you so much for this tutorial!!! My trick for getting the paper torn up small enough is to use an old blender (hello thrift store!). Tear up the paper and add a little water to make a slurry. At least this is how I did it when I was making regular paper and my grand scheme for making these beads. I read that you definitely want to use separate stuff just for paper and not use the bowl/pot/blender for food, too. I’ve seen paper beads made by rolling strips of paper and then coating with glue. but I have never seen it done this way. They look great. at what point do you add the glue? so you do it while you’re rolling the paper or do you mix it in? I love working with papier mache. It’s been a while since I’ve done it and your beads have inspired me to start back up. Thanks for the tutorial. This is really cool/. We run a recycling site (printer cartridges and cell phones) that I’ll post this on. Thanks for sharing such a neat idea. Our recyclers will love it!!! The kids and I started this today… I didn’t read all the comments first, so I don’t think we got the paper shredded enough. Anyway, our first batch is sitting in the open window drying… we will see how they turn out! I am very exciting, though I am sure it will take a few batches for them to work well. What about adding a varnish or sealer prior to forming the balls to help make them water resistant? The kids were funny… whining about getting sticky during the process! esta carta es muy buena..meravillosa, un espectaculo de colores.. Cool concept, with a great result. Thanks for sharing. This is a wonderful idea. I love all of the pictures. I have gotten into making paper beads again, it is such a great way to use scraps of paper and to recycle. I will definitely try this! connected with paper!i love it!i’m happy to share the same interest and love for my recent hobby-papier mache.your beads are simply delicious!and combinnig colors with textures is everything!….the pictures quality is also at level!i love the felted beads! question-what kind of wire do you use.are they stainless? Thanks for this post, which I recently found. I have linked to it on my blog. Great idea… like someone else wrote, I too should have read the comments first… I think the paper pieces I used are too big.. we will see. Anyhoo, I was wondering, isn’t there a varnish or something that we can put on the beads to make them waterproof? Those are great, I’m so glad I found this article! I’ve been experimenting with papermaking with recycled paper, and I can see these as a great extension of that. By the way, if you have an old “stick” (or immersion) blender you don’t mind sacrificing to the cause, it’s a great tool for turning wet paper scraps into paper pulp, without waiting the hour or using boiling water. Very hot tap water and 20 minutes will do the trick if you use the blender. I think they’re way beautiful. Thank you for sharing this information with us. This is a great idea. Ive done similar work..You can also use old nail polishes for update colors to match up with clothing. I got into paper bead making this summer (I’m a teacher who has summers free) and just fell in love with this craft. However, my beads are all rolled. 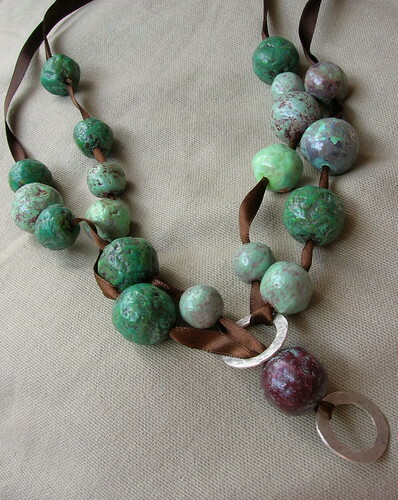 I am so happy that you have shared these earthy round beads with us and I can’t wait to try making some. Thank you so much for passing this craft on to us all! I studied environmental education at tertiary and been looking for practical ways of turning waste into invaluable gifts for people. Obviously making money from it. I am looking forward to learning and transferring this skill to those who would appreciate it. Your website is truly a treasure-filled chest. Thanx a million x over. Thanks for having this craft online. I just started working with the elderly at our local nursing home and I can’t wait to try this. i was just wandering what to do in my spare time (which is pretty much at this moment) and i found this lovely website. i’ve started doing the beads – i torn the newsparer with which my dog helped me and then i put the boiling water 🙂 so now i am waiting – hope i’ll manage to make cute beads…. This is great! I just love to make some of these on my free day. I just love the colors and the style are absolutely unique! I bookmarked this page and so I can have this as a guide in making my own beads. Thanks for posting this and sharing it to us. God Bless. but in the mean time I wanted to give you an award for making me SMILE! 1)Add the logo of your award to your blog. 2)Add a link to the person who awarded it to you. 3)Nominate at least 7 other blogs. 4)Add links to those blogs on your blog. 5)Leave a message for your nominees on their blogs. I’m doing this for x-mas.I think my family will love it. I cant wait to see there reaction. They all ways get jewlery but this would be something differnt. This x-mas is going to be so fun my family will love your idea. I know that this is a great idea to make for x-mas. I would love to learn more. I cant wait to try this idea.I’m doing it this thanksgiving. My cosin all ready saw the idea and cant wait to get hers. I cant wait to see how they turn out. I am just wandering how do you drill the beeds? what kind of tool I should use to make a hole in the beeds. This is such an awesome idea! I might use it as a business-from-home idea, as everyone in my school is crazy about the environment, and I might share it with the local Earth club, it would be a great group activity. I love chunky colorful beads, and the ones you posted look fantastic!! I can’t wait to make mine! Thanks for posting! God bless. I have added a link to this article on my blog today! this gave me an idea for x-mas. I just have to say, awesome blog! This is such a fascinating idea, I’m dying to try it! I was just wondering, do you know of any surface in particular that I should use to dry the beads? I was thinking about a cookie sheet for baking, or some aluminum foil. Also, my friend was thinking about starting a little business on the side with recycled items, and I told her about this. Any tips? Thank you so much for this wonderful wee blog! I am always on the look out for involving, fun, and cheap (we don’t really have much of a budget!) crafts to do with the young people I work with. Now thats what i call Art!! i would have never thought of that personally. i have seen all sort of beads here in kenya, but nothing like this. I guess there will be much bigger and greater gifts this valentines. Am a fun of recycling and since kenya doesnt have a paper recycling system, i guess i will try this out with the youth in church. great work!!! Wow, I love the organic look to these. As a beader and a recycler you really caught my attention! I’ll be writing about this and linking to you on my Art of Recycling blog. I’ll do it again on my Beading Blog after I get a chance to make some of my own. Thank you so much for passing along this information. Those beads are beautiful! And now I can’t wait to get started making them. how should i let them dry. won’t they get a flat side? if i use a toothpick while drying to make the hole, how will i be able to re-roll it every few hours, (will they turn into oval/long beads)? i was looking at your beads on flickr, and some of them are wrapped in cotton string. how did u do that? did u paint them, put the varnish on, and while the varnish was still wet, did u wrap the string around… then put more varnish on top????? i am going on a missions trip to guatemala this summer with brio magazine… and i need to raise around 3000 dollars. i was wondering how much i could sell necklaces and bracelets… and maybe even earrings(ive quilled earrings before) for? obviously it is for a good cause, and it would make a great profit, since they cost virtually nothing! i just wanted to tell u that these beads are AMAZING! great job! hopefully after a couple of tries i will be able to make good beads like u! thanx so much for the great idea! dont sqeeze all of the water out while rolling them. if a bead falls apart while u r rolling it, or or re-rolling it after a few hours of drying… go to the sink and drip a few droplets of water one it and re-roll… theyll be good as new! i used my big brothers drill he uses for model airplanes to drill holes. when painting, paint on wooden skewers. varnish on wooden skewers too! use plastic paint for ur bottom layer of paint… otherwise u will end up sandpapering off the bottom layer, showing how grey the beads are! I made a ton of these and LOVE It. It was so much fun…I hope you don’t mind but I posted pictures of a couple of the bracelets I made and will giving you credit (with a link). Imagine my surprise…I have been making beaded jewelry for a short time, and recently came upon a business venture with my employers. They asked me to make jewelry out of recycled stuff (we are a recycle business)which they would buy from me. These beads are perfect and beautiful. Thank you for sharing and don’t ever be sorry for your business mind. I believe with your help and if we help each other as human beings, there will be a brighter future for my children and I as well as many other people. I would love to see your beads. I can not get enough at looking at these fascinating beads. They are so beautiful. I have tried making these, it is not easy but quite rewarding. I made my own glue using cornstarch and it work quite well. I find it easy also, to just drill it after it has dried so you can keep the round shape. It is also helpful to re shape the beads and mold them into round shape as it is drying so it does not lose its shape. I just saw something like this featured on etsy that’s made into magnets and shaped like hearts, pretty cute. I am very happy to know how to make beads because it had helped me to make a necklace for my mother as a gift on my mother’s day. Were the FELT beads made using the same method? is there a way to control the color that the beads turn out being? I’m working on a necklace but I want to have the colors stand for things. haha umm.. so ignore my last comment. great work. love the blog. I started making those beads some months ago, but how do you paint them so nicely?! now i don’t need to ask my mom to go to the supermarket to buy beads beacause now i know how to some the easy way! I saw this blog a few months ago, and the beautiful beads stuck in my mind. I tried it a while ago and also took your suggestion of starting a little business! Check out my Etsy shop at http://www.EverydayDiamonds.etsy.com! I dont speack english… i so sorry. I love work with papers, stons and colours. Would love to see a painting tutorial for these beautiful beads. This was a rainy day project and we finished it on a cold day (the weather has been less than co-operative for July). The turned out so nice. We’re going to buy a nice bowl and display them in my 4.5 year old’s bedroom. I would love to know the technique you used to paint these pretty beads. Please share. thanks so much for posting this! it is a great craft idea and the beads look awesome! i can’t wait to try it out! I love the look of these beads! I’am going to mix up a small batch tonight to see how they do for me! I;m loving this idea and have got some drying out but please would you beable to share with me the technique of how you painted these bead, There absolutley stunning. Thank-you for sharing! I’ll tear up my paper tonight and let it soak in water all night. Sure glad I read all the instructions well, and the comments; so I don’t have to ask you one of those repetitive questions. lol! how do you drill the hole?after they get dry or before?and with what? Thank you for sharing a wonderful idea. i hope you could still share other tips how to make beads from recyle or help us spend less for making beads and accessories. keep up the good work. Hello Pearl, I can not get enough of your paper mache beads. Got any more pictures???? This is incredible. We do a class for home schooling moms on using the web to find ideas to keep your children engaged in the learning process. This site is definitely on our “Goto” list. 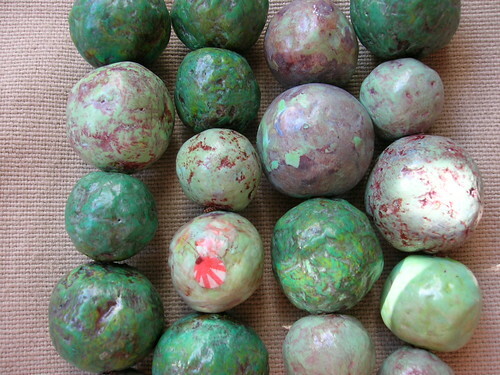 I’m in the process of making my own recycled paper mache beads now, but am using old egg cartons instead of newspaper. I absolutely love the beads Helen has made and hope mine turn out as well. You definitely cannot beat the cost of the beads nor the fact that each bead will be its own unique creation! Thanks for the pointers and excellent photos! ahw..i guess i was not able to read every comment..i got the answers already thank you…but one more thing… what kind of paint did you use? Hi. My name is Maryam. I am the founder of Womenfound. We are a tsteful boutique retail store that benefits women. I would love to carry some of the beaded pieces made by readers. Our proceeds are donated to charities and foundations that help women around the world. I also have some unused loft-space where I’d like to start workshops for kids and adults to create the beads and make earing, necklaces and bracelets. Please let me know if anyone is interested in creating pieces for sale and/or helping spearhead the classes. How long did this process take to make enough beads for a necklace? Is it hard to drill the beads to make the holes? Thanks, these look awesome! So here I am trying to make these. Silly question I am sure…but after pouring glue all over a pan full of drained and still damp newspaper, trying to make that into balls and having no success, now I am taking little bunches, pouring glue onto those and trying to roll them into balls – UMMMMM – GIANT mess all over the place. What am I doing wrong? Or is this supposed to be really messy. I don’t know if my previous question went through. One of them I found out myself. But I would like to know at what point you put glue in them? Do you put it in the whole mass of paper and then roll it out? That seems to be a LOT of glue. Or do you use glue for each individual bead you roll? Prettier beads than any I’ve seen for weeks of looking at the car boot sales. I’ve trawled through hundreds of pots of old beaded necklaces and can’t find any I like. I think it’s time to make my own! how to make it bright?? any info would be appreciated. I just LOVE these earthy crafts. Reuse, repurpose, reduce, recycle, love it! Yesterday’s news, tomorrow’s necklace! I’m not sure if my comment posted. I LOVE these beads. They’re very cool. I make paper beads from rolling up paper but this is a whole different approach. Very nice! 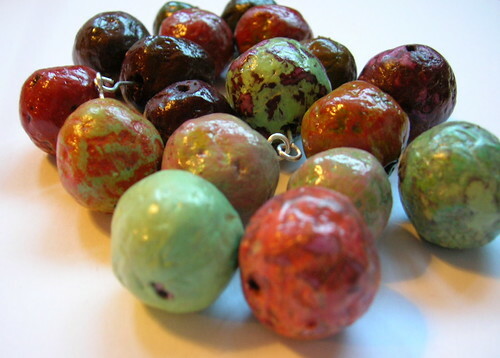 What a great, inexpensive idea–making beads out of newspaper. I have been experimenting with making my own beads, expecially faux turquoise (since turquoise is the rage right now in fashion). I used wood beads with paint–wood is light-weight and unbreakable. I will try making some out of the newspapers, and make it looke like peices of turqouise stone. Thanks for sharing the idea. Love this idea for my Junior Girl Scouts! I am looking for instructions on how to weave baskets, kleenex box covers, platters, etc out of twisted newspaper.. I found and took pictures of some of these for sale in Mackinac City, MI… and just thought it was a great craft for us to do… however, I have not found ANYTHING on-line for twisted weaving… can anyone forward me any ideas or a site to get free instructions?? Thanks!!!! this is very creative and cool that you had the time to make this and still have fun will your donig it.If you didnt make it on your own creation than tell me where i can find the website.Thank you for your time. P.S good job on telling me how to make it. Pingback: Lovely Links – my Guest Curator links compiled! Love these! I linked to it in an article I just published here. this is really stunning! Thanks! I HAVE ATTEMPTED TO MAKE THESE, AND ROLLED THEM SO SMOOTH AFTER A DAY OF DRYING AND THEN PUT THEM IN THE MICROWAVE TO SPEED UP THE PROCESS OF DRYING AND IT WORKED GREAT. Can someone please tell me how to get this marbelled look on the beads?? To get the marble paint look: first you use diffrent colored papers when they are dry and sanded use a none colored glossy varnish, paint the bead with tissue paper with bits of paint here and there then let dry and sand again, then add another coat of glossy varnish. You have to be a little creator thou. It worked with me fine better than the one in the picture. Wow, very nice beads. I think i’ll try to make them myself. Thanks so much for sharing this idea! I am in the midst of starting a small home based business and I think this will incorporate well with my theme! I plan to test some bead like items with scents such as cranberry for Christmas decor. I have a clear vision of them strung as garland as they bring the smell of the season into my home! Maybe dip them in scented candle wax for fire starters in the fireplace! I’m also in a Church group that feed the needy and this may work as a great fund raiser! I especially like the “felt” beads, these may look great with a denim type look catering to the young at heart. My mind is racing with endless ideas… I will let everone know how these turn out as soon as I succeed :)also feel free to try my ideas and share your results with the rest of us… Again, thank you for sharing. LOVE THIS im making some right now to make Grape decor for a wine taste party. and thank to the person with the blender tip. makes it a lot faster. Can’t wait to try this!! Love the marbled look of the paint. Was wondering if I could roll them in the second color to produce that effect, or maybe sponge on the second color? Wow !!!! Awesome. I will try. 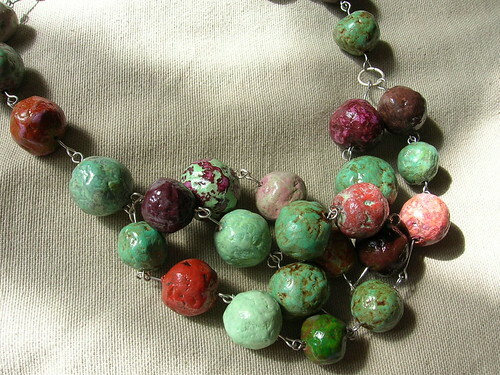 Great idea, I love the paint effect on your beads, they look marbled! I have made paper beads from old magazine with bright colorful pages. I will surely try making these now since my sister will have plenty of old newspapers to donate for the project. However, what is the BEST vanish to use for beads? I ask since people will wear these against their skin, worried about reactions and sweat. After all, I would not my Bead Gifts give anyone a rash or stick to their skin! I absolutely like your blog and find nearly all of your post’s to be precisely what I’m looking for. Again, awesome site! Fantastic post I ve been looking for a tutorial like this for days. Thank ou both for sharing. I also would like to know what varnish you recommend for the beads. These are beautiful. Thanks so much for sharing. I would like to know what type of varnish are we talking about (name brand, where to find)? How do you do the felt? Your beads are absolutely beautiful! How do they hold up with constant or daily use? love the beads….. i made a bunch of them myself! How do you paint the marbled coloring effect on the beads? Pingback: Cheers For Coupons – What do you do with all those newspapers? I have an article on my blog on how to make homemade paper, but I don’t let the paper sit and soak. It gets shredded then whirled in a blender. I like these colorful beads! Does she use the funny papers or ads to get the multi-colors? Eu já havia visto esses trabalhos e nunca poderia imaginar q eram feitas de papel jornal, muito bonito ,vou tentar fazer tbm, jornal eu tenho bastante. Hi there, what a brilliant idea 🙂 , i like so much this idea..Tq 4 sharing. I really like these beads. I would like to teach some of the kids in my class how to make these. I am a missionary in Honduras and teaching kids crafts to sell locally and elsewhere. When you say to paint them with leftover craft paint… what is that? Can I use any kind of paint? Hope I heard back from you soon! Thanks!! When I say craft paint, I mean the small bottles of acrylic paints we typically use in crafting, but you could use pretty much any paint you have available. The beads are stunning, I love them! will be making some soon. Thank you Karen for sharing this cool idea. I like to show you how things worked out! We sell the chains for charity (Soroptimist International) in our region in The Netherlands. Hope the photo’s come through! Thank you very much for sharing this wonderful idea with us! This is such a great idea! I would do it to make Christmas tree garlands. I am going to share this link at my forum as well.